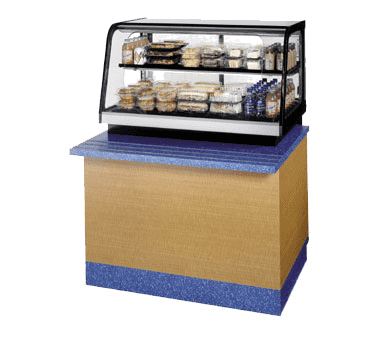 The Signature Series counter top self-serve merchandiser combines attractive curved glass styling and merchandising flexibility. Designed for continuous case line-ups. Cases are available in lengths of 3' and 4'. Shielded top light and shelf light. Removable sliding rear doors, shelf light, shelf supports, and shelf. Set directly on counter with condensing component mounted on rear (CRR Models). Tempered front glass with self-serve cut out for customer access. Acrylic end panels. Adjustable black metal shelf. Adjustable up and down and can also be tilted in two positions. Recessed 3" in the counter with condensing component mounted underneath (CRB Models).